Main Informations: What is Ramanattam? Ramanattam is a classical Indian dance-drama in Kerala. According to legends have it that as an Offshoot of the rivalry between the Kottarakara King and the Zamorin of Calicut in 1657 AD. Ramanattom presents the story of Rama in a series of 8 plays and was created under the patronage of King of Kottarakkara. (Word ‘Attam’ means Enactment). It is based on the Ramayana Story and it was written by King of Kottarakkara. Ramanattom is divided into 8 poetic sections. Each section can be acted in only one day. The sections of Ramanattom (8 sections) are Seetha Swayamvaram, uthrakameshti, Vicchinnabhishekam, Balivadham, Kharavadham, Sethubandhanam, Thoranayudham, and Yudham. 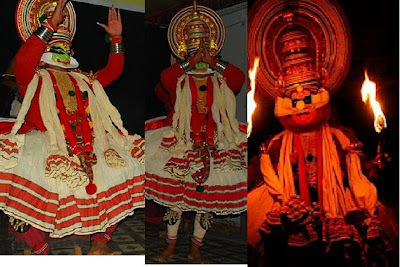 Ramanattom also shares some similarities with Kathakali. It is widely believed to be the Ramanattom that developed into the famous classical art form of Kerala, Kathakali. The songs of Ramanattom were all in Malayalam language. Its elaborate make-up code is one of the most interesting aspects of Ramanattom. Ramanattom also incorporates several other elements from ritualistic and traditional art forms of Kerala like Thiyyattu, Mudiyettu, Padayani and Theyyam.